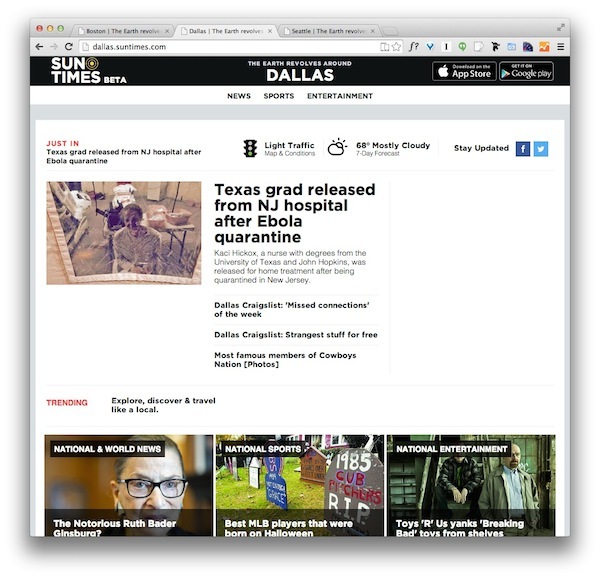 Oct. 28, 2014, 11:06 a.m.
By Ken Doctor @kdoctor Oct. 28, 2014, 11:06 a.m.
Coming, officially today, to your hometown: A templatized, national/local, ready-to-go network of 70 news sites and apps that aim to make use of all the au courant digital news business knowledge of the day. It’s called the Sun-Times Network, and it’s the latest attempt to try to do local news at a national scale. It’s turnkey. The big question: who exactly will open the door? These new metro-wide sites have been loosed in the Android and iOS app stores, at least one for each of the 50 states, and covering the top 50 metro areas. The goal: to build a fast-scaling national ad network on a hybrid national/local model. Intriguingly, the initiative takes flight out of a struggling, we’re-number-two newspaper company. The Sun-Times Network pops out of Wrapports, since late 2011 the owner of the Chicago Sun-Times. Yes, the same Sun-Times that won some national ink last year by laying off its photographers and made news last week with the reports that it would soon sell its extensive collection of more than three dozen suburban newspapers to its long-time rival, the Chicago Tribune. And it is born out of the criticized low-cost local news startup Aggrego. It’s easy to write this off as a Hail Mary from a flailing newspaper company — and it’s possible that will end up being its epitaph. But it is its application of today’s digital business ideas — and its CEO — that compels at least some attention. 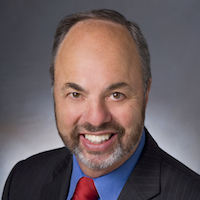 Sun-Times Network CEO Tim Landon knows network, scale, the ad game, national/local, and lots more, given his many years of stewardship (and scars from) Classified Ventures. 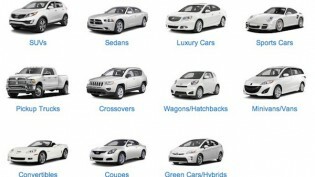 Its products Cars.com and CareerBuilder became two of the newspaper industry’s relative few Internet successes. When Gannett spent $1.8 billion for the 73 percent of Cars.com that it didn’t already own, the company’s four other investor owners did well cashing out at a hefty gain (“The newsonomics of selling Cars.com”), after years of profits that partially offset the declines of the overall newspaper business. Now, Landon, a 22-year Tribune Company veteran (through 2008, when the Sam Zell bus hit Tribune Tower), sees a local media-centric model that he thinks could scale. The Sun-Times Network model is based, in part, on Caribbean experimentation — an unusual digital export from that part of the Americas. Check out LoopJamaica.com, one of a string of test Caribbean sites that led to the new U.S. network. Why the Caribbean? Irish billionaire Denis O’Brien, the chairman and founder of Caribbean mobile provider Digicel (“Denis O’Brien, Ireland’s version of Mexico’s Carlos Slim, sells mobile to the masses”) embraced this network model and became a major funder of it as Wrapports’ minority partner. Those sites continue to operate. A test site in Dublin — which Landon says quickly gained 90,000 visitors — isn’t still up, but may be revived, he says, along with other implementations in Europe in 2015. The idea here is a fairly simple one. Launch all the sites, and then use local media player partners — a mobile provider, a TV or radio station, a chain of weeklies, a monthly magazine — to grow awareness and traffic in markets. No partners will be announced until at least November. The partner profile: A company that knows it should be in the digital game, but isn’t yet in, and doesn’t want to invest in the work of getting in itself. 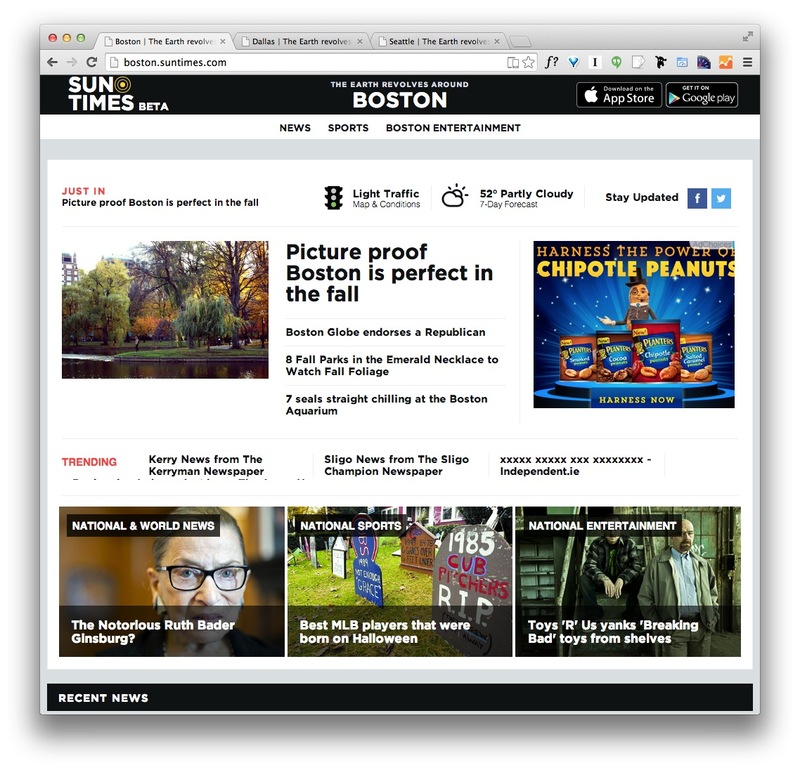 Sun-Times Network provides all the tech, most of the content, and the advertising. Just add local marketing and, ideally, some local content, and partners share 50-50 in the national ad revenue; a less-than $10,000 startup fee is also part of the deal. At best, a local provider will provide “five to 10 original pieces of content a day,” Landon told me Tuesday. Further, local providers can use the existing sites or private-label the product — using its own URL, but leveraging the same tech and business model. It’s a non-exclusive model, at least for now. Landon attributes that both to an “open” philosophy (think open source and Guardian Open) and to the need to build scale. The more participants, in theory, the faster the network grows. And grow it must: Figure this network needs to hit a mark of 10 million unique visitors a month by a year from now, and then build from there. While nichier audience analytics will flow through the system, as audience grows, this is a mass play. Volume counts, and volume may be difficult to build and to keep. After all, Yahoo — a volume champion, with lots of bells and whistles attached to its massive scale — still fails to grow ad revenue sufficiently after all these years. Low cost. This national network bases itself on about $14 million in investment. At launch, 30 staffers make up Aggrego — 15 in tech, the other 15 journalists. Platform-centric. The power here is in a centralized content and ad management system, responsive and analytics-centered. Mobile first. Go where the audience is going. Socially savvy. “The future is social,” says Landon, borrowing pages of the BuzzFeed/Vox/Vice playbook, which leverage the great and growing power of Facebook (David Carr: “Facebook offers life raft, but publishers are wary”) and Twitter much more than old search engine optimization tricks of the trade. Aggregation ascendant. The network says its journalists will both “curate” and aggregate; we’ll see how much distinction they bring to those overlapping terms. It’s the infinite linkability of the web that makes the Sun-Times Network at all possible. Such sites as its Atlanta one fills its national (news, sports, entertainment) channels and local ones with links, links, and more links. After all, the original name of this effort was Aggrego, and that Wrapports site is still up. Aggrego, as in uber-aggregation. Aggregation makes this all possible. Now supplanted by the Sun-Times Network brand, Aggrego is already onto its second life, giving its name to the network’s platform. First envisioned as a hyperlocal network, based on the same set of digital innovations that now fuel the metro launch, it built out its first tests in the greater Chicago area. About 40 Sun-Times hyperlocal sites use the Aggrego tech, each attached to the Sun-Times suburban newspapers, like this one in Vernon Hills. Those suburban products fit under the Wrapports umbrella, but on a separate tube from the group of 70 nationwide metro sites announced today. Same tech, similar idea, different scale. Importantly, if last week’s report that Tribune Publishing is close to finalizing a deal to buy the Sun-Times regional properties is true, these Chicago-based sites could be packaged off with those print properties, leaving Wrapports to focus on both its struggling core paper and the growth it hopes to wring out of the Sun-Times Network. “We’ve flipped the model,” says Landon. Take the original ideas out of suburban Chicago and embrace first the major metro areas of the country — and then the world. The simple reason, as everyone has learned (including, painfully and publicly, Tim Armstrong): There’s very little money in hyperlocal news. The flip means not only going going from hyperlocal to metro. It also means trying to leverage the shrinking (but still valuable) assets of Sun-Times journalism more widely. So Richard Roeper, the heir to Roger Ebert’s film role, is more than a Chicago Sun-Times or a wire/syndicate asset. His work can play these 70 sites and more, as can national-quality sports and other cultural coverage. Can this network find a small place — “We’re not trying to take out the AJC [Atlanta Journal Constitution]” in Atlanta, for instance, Landon notes — in the hypercompetitive metro markets? The odds of major success seem long. Are these sites just too generic to break through the noise of the web, and the clutter of the smartphone screen? Is there enough different about the site, with its thin foundation of original, national-ranking Sun-Times content? Is there simply enough Sun-Times or original (national and/or local — content to create an identity for these sites? Will the advertising revenue be sufficient? Remember, this is a low-cost operation, with no direct sales staff of its own to start. That means it is wholly reliant on programmatic network advertising, fetching $1 to $3 CPM (cost-per-thousand) rates for display ads. If and as it gets a significant news video business going — in competition with everyone else — those rates would be higher. Our third question is the most brain-boggling. Why would it take a struggling, No. 2 paper in Chicago to figure out regional aggregation across the country? From Topix to Outside.in and numerous others, the idea of using tech to aggregate local stories is one that’s been tested by quite a few non-newspaper companies. Any local media company — a newspaper or a TV station, among other suspects — could do that same thing. The biggest issue has been mindset. Local “papers” still think they’re in the original content business, despite the fact that as decades-long distributors of “aggregated” wire and syndicate content, they’ve always been aggregators. 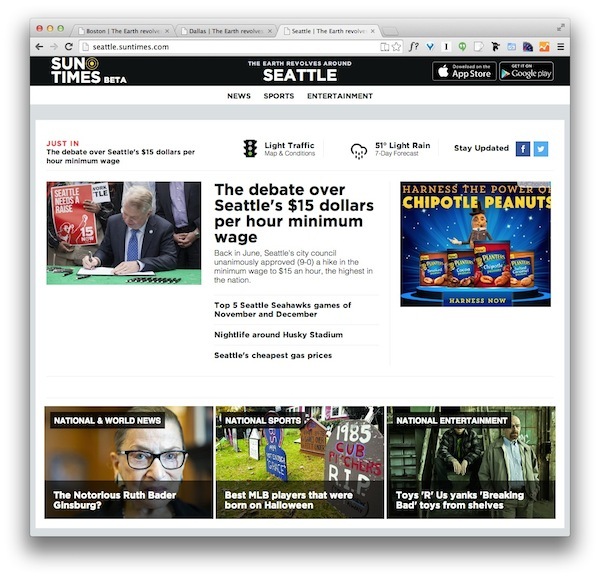 In 2009, when Hearst’s Seattle Post-Intelligencer collapsed from being a full-fledged local news source, it relied on aggregation for its new digital-only life. Much more recently, The New York Times bet on aggregation with the curated NYT Now, recently moving its briefings onto the main-site mothership. It’s not hard, but it requires a mindset change for news media, who we must unfortunately note can be pathologically slow to change. Simple idea: Do both. Leverage the strength and uniqueness of the original content, and provide the breadth of the web, well chosen. 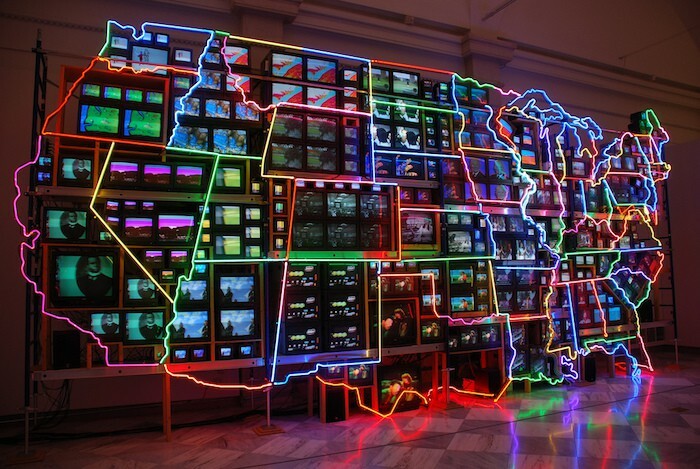 Photo of “Electronic Superhighway: Continental U.S., Alaska, Hawaii” by Nam June Paik (1995) by Adam Fagen used under a Creative Commons license. POSTED Oct. 28, 2014, 11:06 a.m. Doctor, Ken. "The newsonomics of the Sun-Times national/local network play." Nieman Journalism Lab. Nieman Foundation for Journalism at Harvard, 28 Oct. 2014. Web. 19 Apr. 2019. Doctor, Ken. "The newsonomics of the Sun-Times national/local network play." Nieman Journalism Lab. Last modified October 28, 2014. 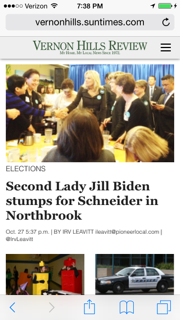 Accessed April 19, 2019. https://www.niemanlab.org/2014/10/the-newsonomics-of-the-sun-times-nationallocal-network-play/.